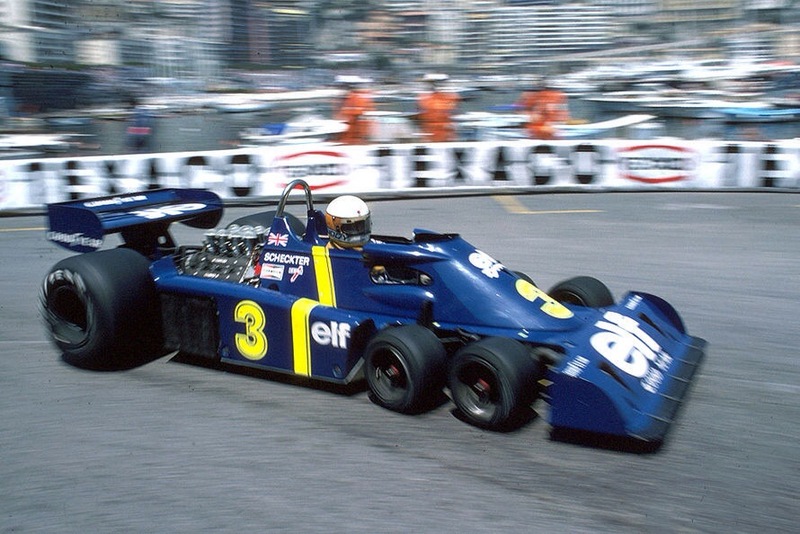 Tyrrell were an amazingly innovative small team. 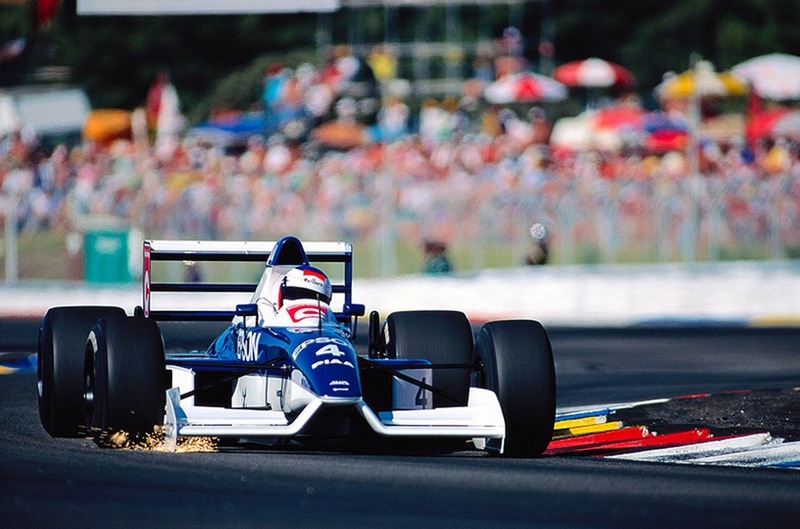 Jean Alesi here in the 1990 French Grand Prix driving Designer Harvey Postlethwaites’ ground breaking and trend-setting ‘highnose’ Tyrrell 019 Ford DFR…There were three distinct design regimes at Tyrrell. 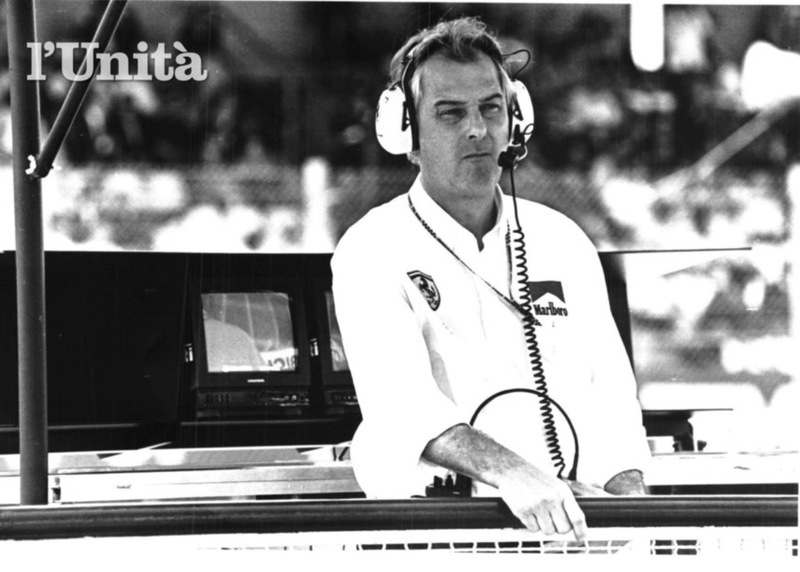 From 1970-1977, the Derek Gardner era, 1978-1988 when Maurice Phillippe was at the helm. Finally, from 1989-1998 Harvey Postlethwaite lead the design team until Tyrrells’ sale, the long established, family owned outfit morphing into ‘British American Racing’. The Gardner and Postlethwaite periods were particularly aerodynamically innovative. 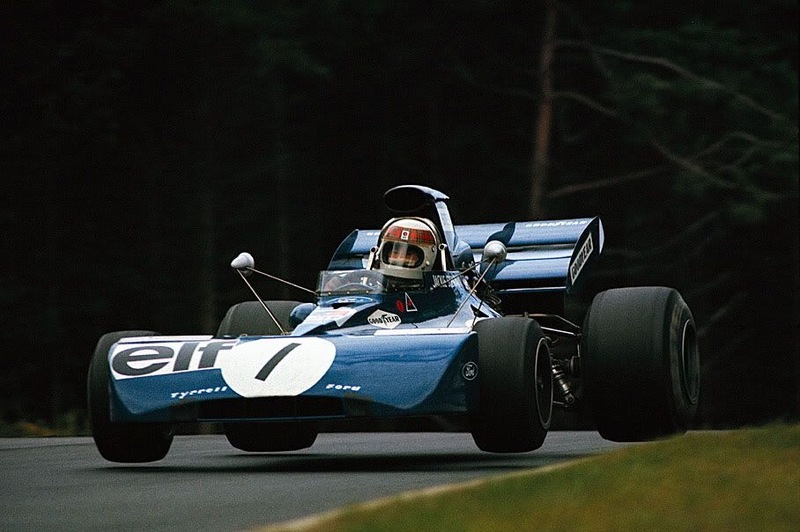 In 1971 Gardner introduced two important innovations to his Tyrrell 003, the first was the high airbox, which debuted at the Dutch Grand Prix, Matra similarly equipped. Chris Amons’ MS120 V12 also having a ‘snorkel’. The primary effect was mild ‘supercharging’ of the incoming fuel/air mix, the secondary was aerodynamic, the simple snorkel quickly evolving into carefully sculptured rear bodywork which included the snorkel, and smoothed airflow to the rear wing, aiding downforce and allowing a marginally flatter wing setting to be used. In essence, less drag for the same downforce. 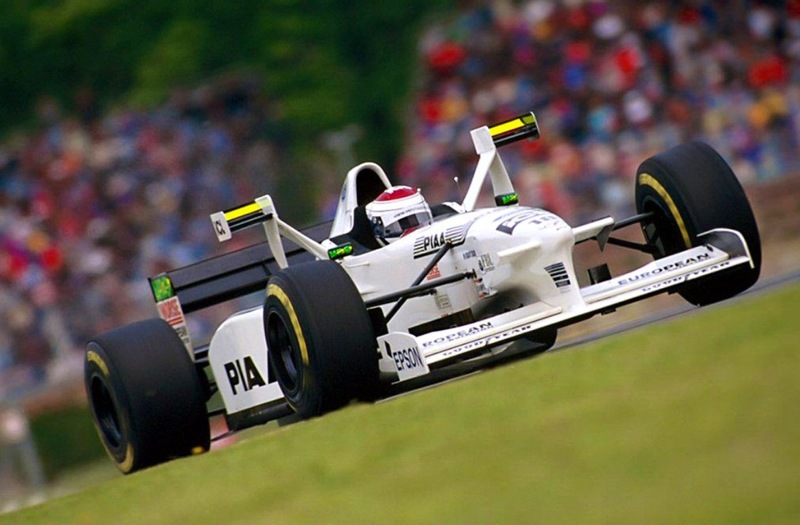 In the French Grand Prix, Stewarts’ 003 raced with a sports-car type nose, Gardners’ idea to partially mask and aid airflow around and over the front wheels of the car, the wheels/tyres being aerodynamically the least efficient part of an open-wheeler. 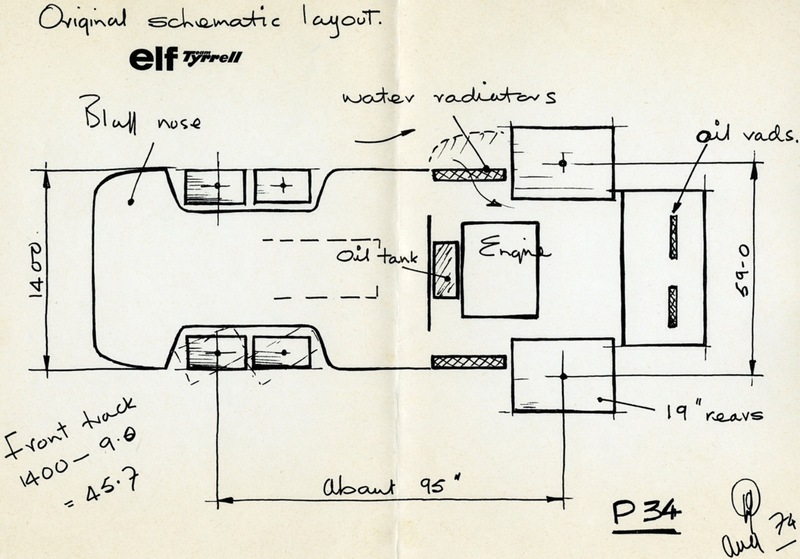 The Lotus 56/72 set a trend with their wedge shaped, side radiator design, the 72 appearing in 1970. 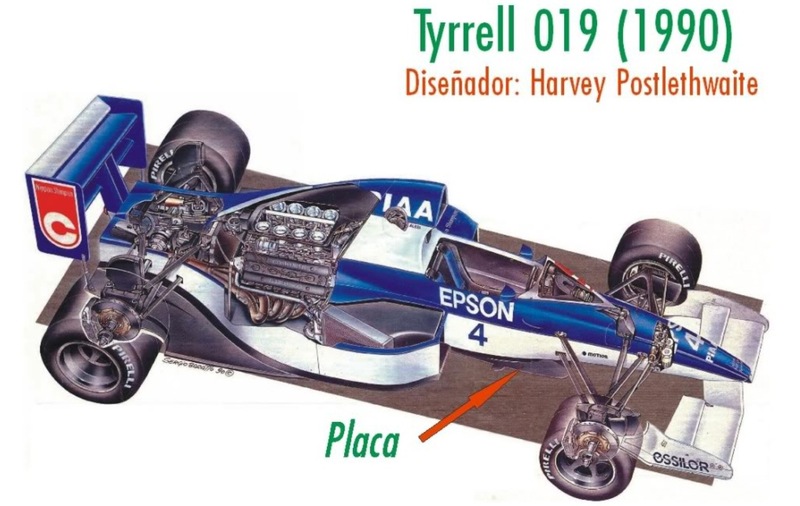 The other alternative aero approach at the time, ‘Pre-Tyrrell Nose’, was the ‘pregnant-belly front radiator approach’ of the BRM P153/160, Mclaren M14, Tyrrells 001-003 and others. Gardner set the alternative aero trend of the 1970’s, until the advent of the Ground Effect Era, with his bluff sports nose. 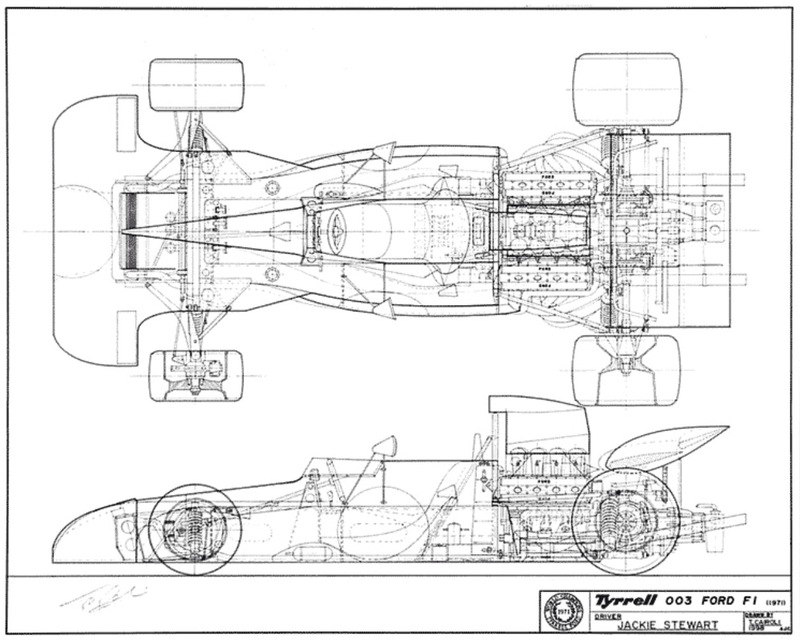 Look at the results of the two alternatives over that period from 1971 to 1979 when the needs of ground effect tunnels favoured the ‘chisel front wing and side radiator approach’ as against the ‘Tyrrell nose, front radiator approach’ cars of both designs were successful, perhaps the former ‘wedge/side rads’ was the more successful. 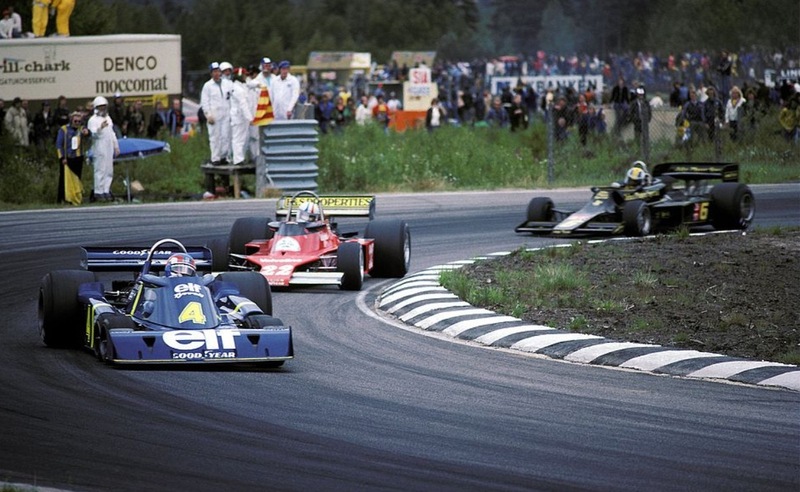 Examples of winning ‘chisel/side rad’ cars are the Lotus 72, McLaren M23, Ferrari 312T’s and of the ‘Tyrrell nose/front rad’ cars the Tyrrell 003-006 and Brabham BT42/44. Both models were Grand Prix winners, the P34 once only, in Scheckters hands in Sweden in 1976. 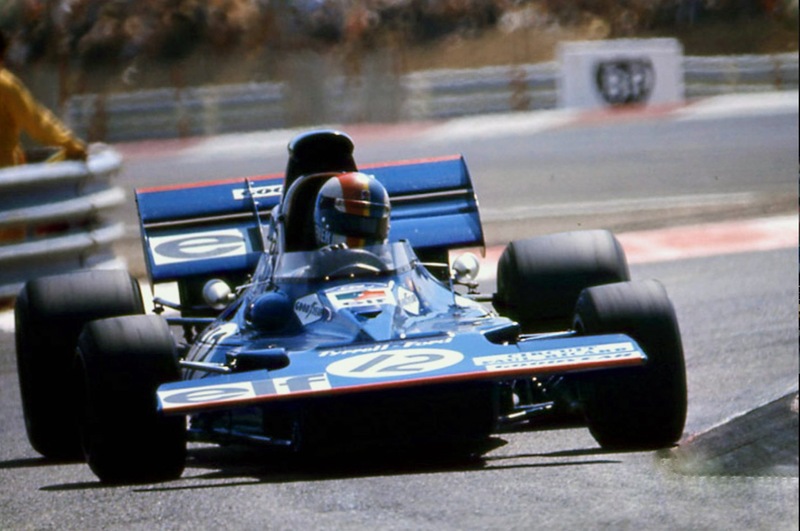 Gardner was recruited by Tyrrell from Ferguson Research where he worked on advanced 4wheel-drive systems used on the Matra MS84 Ford, 4WD F1 car of 1969. That car used Ferguson componentry. The Matra, as were the other 4WD cars developed by Cosworth and Mclaren, was unsuccesful, wings and tyre polymer chemistry providing grip more simply than 4WD technology of the day could. 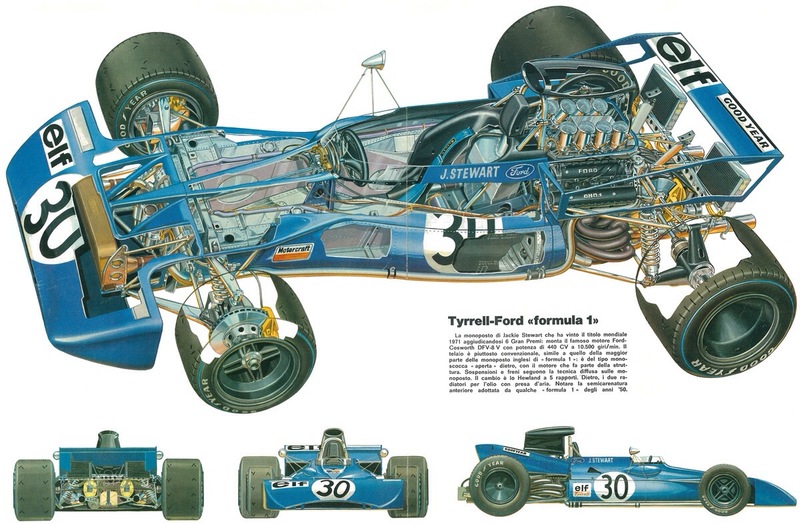 But Ken Tyrrell was impressed and recruited Gardner to build the first Tyrrell 001, secretly in 1970. By the mid-70’s the challenge of the aluminium monocoque/Ford Cosworth DFV/Hewland FG400 gearbox brigade, ‘The Garagistes’, in Enzo Ferraris’ words, was how to beat the similarly equipped opposition? Gardners audacious approach was aerodynamic in having 4 small front wheels which could be faired behind his Tyrrell nose, creating greater straight line speed whilst losing no mechanical grip from his tiny, Goodyear shod wheels. Increased braking area provided by the four small discs was a further advantage. 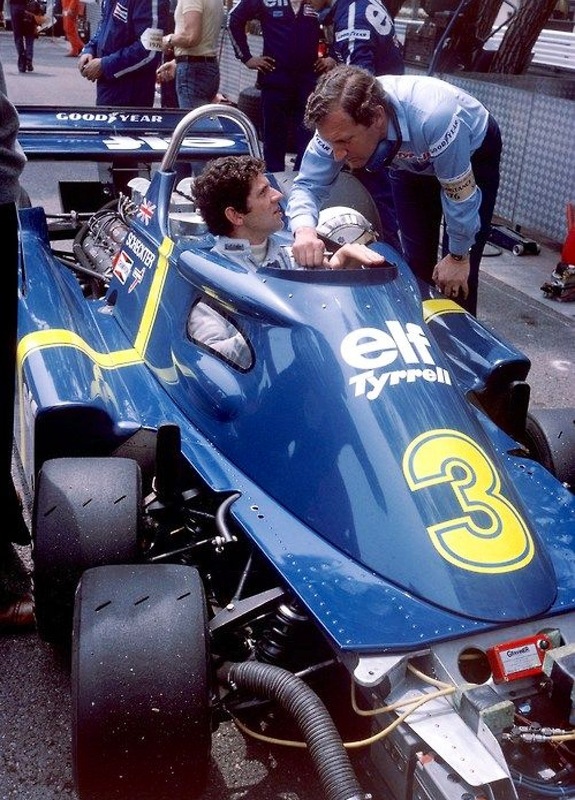 There were mechanical challenges making the package work but the cars were competitive in both Jody Scheckter and Patrick Depaillers’ hands in 1976, less so in 1977 when Goodyear were not so interested in developing special tyres for just one team. Scheckter jumped ship to Walter Wolfs’ new Team in 1977 and was a race-winner in the Harvey Postlethwaite designed cars. Harvey, a Doctor of Engineering, had his motor racing start with March, modifying Lord Heskeths, James Hunt driven customer March 731. He designed the Hesketh 308 in which James Hunt won his first GP and came to Tyrrell in 1988 after two stints at Ferrari including design of the 1982 and 1983 Constructors Championship winning 126C2. Postlethwaite was joined at Tyrrell by aerodynamicist Jean Claude Migeot, together they evolved their competitive 1989 018 into the ground-breaking 019, the car which set the aerodynamic trend until the present. 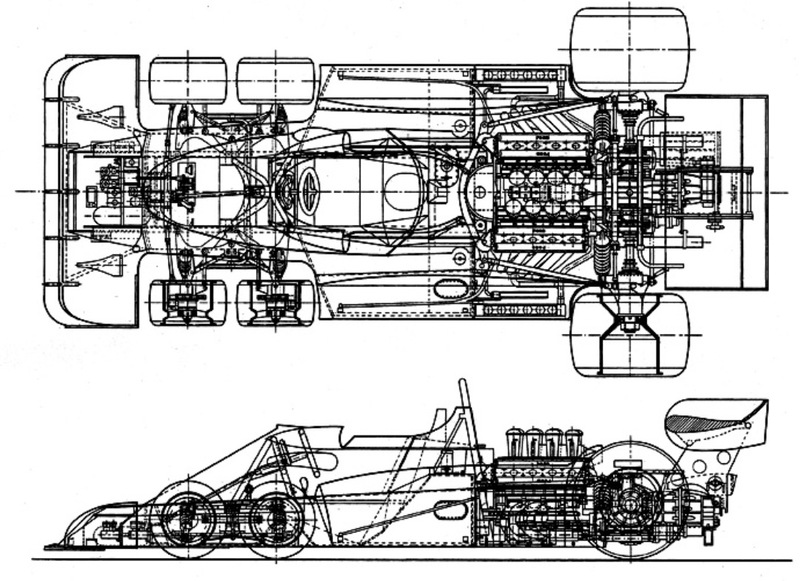 The car was conventional in using a carbonfibre monocoque chassis, wishbone and pushrod suspension front and rear, and Ford Cosworth 3.5 litre DFR V8 / Hewland six-speed transmission but utterly radical in its aero approach. Contemporaray practice was to use a flat, steppped chassis undertray with a large diffuser producing downforce through the generation of low pressure under the car. 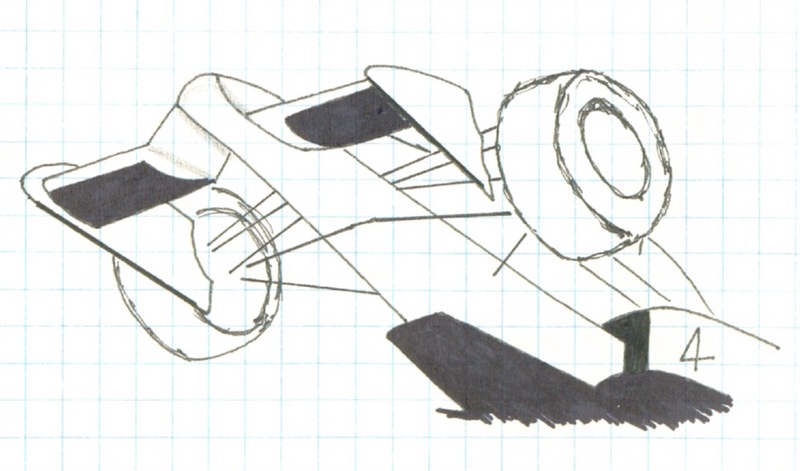 ‘P and M’ realised this approach was compromised by the low nose at the front of the car, the wings diverting air sideways and upwards reducing the amount of air passing under the car. The generation of low pressure relies on increasing the speed of the air passing under the car in relation to the air passing over and around it. 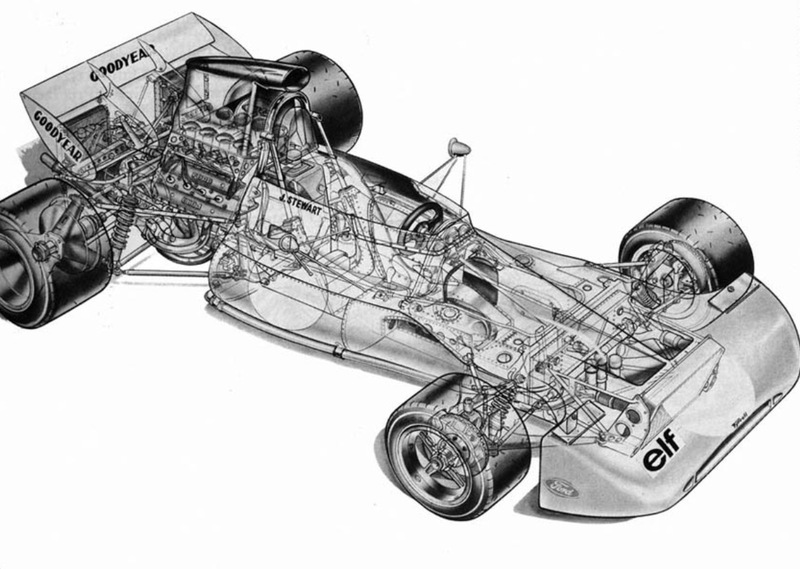 In simple terms , the more air that can be drawn under the car, the faster the air will have to be moving, and the faster the air is moving the lower the pressure and greater the downforce. By raising the nose-cone Postlethwaite increased the volume of air that was able to pass under the car…whilst keeping the wings themselves close to the ground where they work best with the distinctive, inverted V , anhedral front profile. 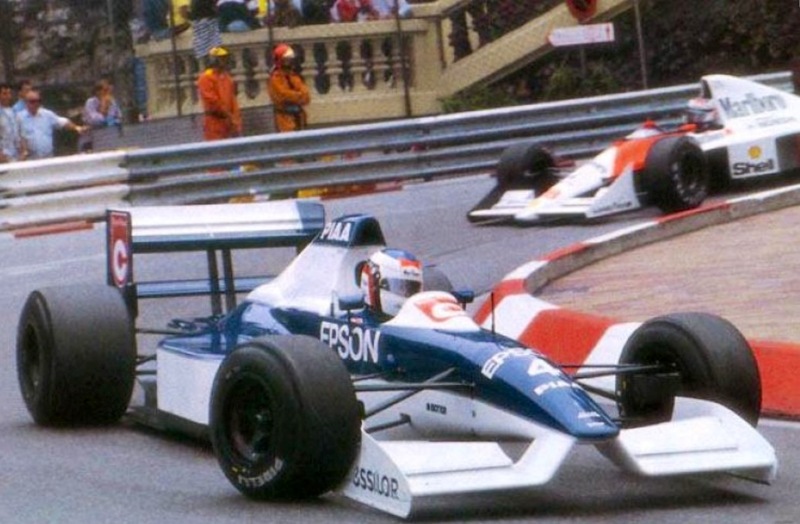 The car was not that successful in terms of 1990 results, Alesi achieving sixth at San Marino and second in Monaco but a trend was set which most teams followed quickly…and principles which prevail today. 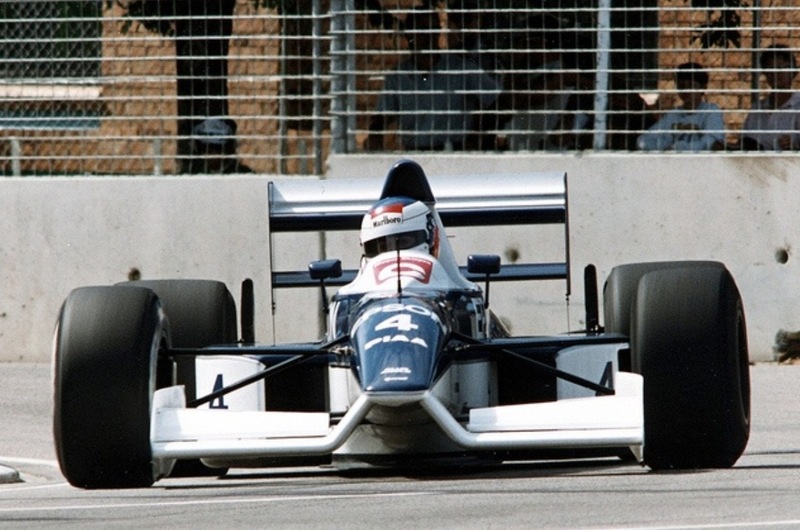 Tyrrell innovation continued with aerodynamically shaped wishbones in 1996 and the ugly but effective ‘X-Wings’ in 1997, on fast circuits two additional wings installed either side of the cockpit. Postlethwaite stayed with the team until it was sold by Ken Tyrrell to British American Tobacco at the end of 1997 and died suddenly of a heart attack whilst testing the Postlethwaite designed, Dallara built, in house Honda at Catalunya in April 1999 aged 55. Ken Tyrrell died in August 2001, and Derek Gardner in January 2011, his post Tyrrell career was as Director of Engineering and Research at the Borg Warner clutch company.